He was the fifth of nine children of Richard Battershill and Elizabeth Hamlyn. JOAN NOSWORTHY was born in the same year. 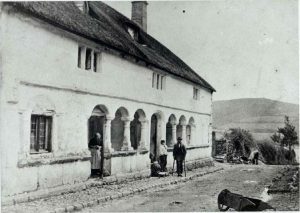 Treleaven’s Diary was written from 1799-1820 by Sylvester Treleaven, hairdresser, shopkeeper, postmaster and local gossip of Moretonhampstead. In October 1799 Treleaven recorded the death of Joan Battershill ‘aged 73 and the mother of 15 children’. If Treleaven is right about her age, she was probably christened Jane. 1727 Aug 16th was baptized Jane daughr of Jane Nosworthy, a base child. This is the best fit for an age of 73 when she died, only one year out. There was another baptism four years later. The mother of this child was Grace Hosgood. In the 18th century, ‘Jane’, ‘Joane’ and ‘Joan’ appear to be used interchangeably, so there is no reason to discount the earlier baptism on that ground. It is true that people’s ages were not always precisely known, particularly by their surviving relatives. But Joan came from the high-status Nosworthy family, who were more likely to be accurate about their ages than illiterate farm workers. Baby Jane, born out of wedlock in 1727, is probably the right girl. Her unmarried mother, Jane Nosworthy, came either from a family of landed gentry or else from a junior, but still high-status, branch of this family in town. It is unlikely that her mother would have been thrown out on the street to become a burden on the parish. The Poor Law made it difficult for the family to evade responsibility. But there is a record which describes the gentleman’s daughter Jane as a seamstress. Both the possible mothers married after Jane’s birth, in one case to Walter Hutchings, a woolcomber from a high-status family, in the other probably to Cyrus Hill, also from an affluent family, though possibly to the poorer William Launder. It is not certain whether little Jane grew up with their other children. She may have been taken in as an infant by married relatives and brought up with their own family. Jane could have passed her childhood at Great Sloncombe Farm, tucked away in a valley outside Moreton, at the manor house of High Hayne, on the outskirts of town, or in the town itself. The burial register shows another possibility, that her mother died when the child was only three, though this seems less likely. John Battershill and Joan Nosworthy were both 26 when they married. There followed fifteen children, all baptised at the parish church. Moretonhampstead should have changed its calendar in 1752, so that the year started with January 1 and not March 25. Instead, the registers continue to use the old dating until 1765. 1757 Nov 20 Betty Married Thomas Day of N.Tawton, 13 Mar 1785. At Betty’s baptism the spelling of the father’s name changes from ‘Battishill’ to ‘Battershill’ and this is the spelling used from then on. 1759 Aug 26 William Married Mary Easton, 26 Dec 1781. Died 1816. 1761 Apr 19 Mary buried 31 May 1765. Age 4. 1763 Apr 1 Richard buried 27 Nov 1770. Age 7. Moretonhampstead reluctantly went over the modern calendar in 1765, so that from now on the year number given for January, February and March 1-24 is the one we use nowadays, not the same as for most of the previous year. But the Moreton registers continued to be kept from March 25 to the following March 24, simply inserting the new year number when they reached January. 1767 Jun 8 Susanna Married William Tozer 27 May 1792. Died 1797. 1769 Mar 3 Ann buried 13 Sep 1772. Age 3. 1773 Jan 1 Sarah Married William Hole, 20 Sep 1795. Died 1846. John and Joan lived to see the collapse of the woollen industry in Moreton around 1760. In 1799, Treleaven’s Diary records the advent of mechanisation. 1799 Wed. June 5th. Mr. White of Ashburton, took Mr. John Mardon’s house, and enters on it at Mid-summer next, he has several Spinning Jennies, and has bought One-Mill at the bottom of Long-meadow, where he is going to erect a Machine for Carding and Scribling Wool. The Battershills’son William became a woolcomber, and this may have been the family occupation, but Treleaven reports that at the age of 45 he took up a different employment. 1816 Sat. May. 25th. Died in the 57th year of his age William Batershill, Woolcomber, but for the last 12 years he had been a chaise driver. Joan died 23 Oct 1799. Her passing was recorded in Treleaven’s Diary with a note of her age, 73, and the prodigious number of her children. She was buried two days later. Wed. Oct. 23rd. Died Joan the Wife of John Battershill aged 73, She had been the Mother of 15 children. Burial. Moreton Hampstead, St Andrews. John was buried almost exactly four years after her.